The movie kicks off with an assassination attempt on a Chinese ambassador, as he plans to spill the beans on the ancient secrets of the Chinese Triads. 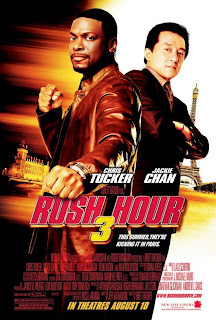 Inspector Li (Jackie Chan) and Detective Carter (Chris Tucker) must team up again to bring down the Triads and keep a promise to the ambassador’s daughter. The chase leads them from Los Angeles to Paris. Along the way, we have the expected comedy bits (the kung-fu dojo scene sticks out), Carter’s motor-mouth and not much else. 😛 not a big fan.